This is the sample ribbon crystal necklace that I made for my friend's daughter who is getting married in August. This necklace is for the eight bridesmaids at the wedding. 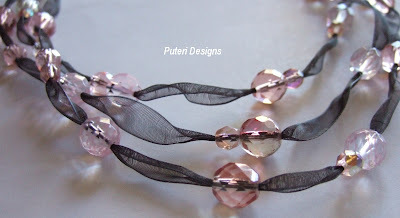 The final decision is for a single strand of ribbon and crystal necklace. The reason being the bridesmaid's dress ride high on the chest and they don't want the three strand necklace to overwhelm the dress. 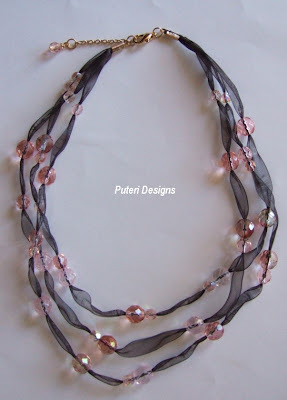 The single strand necklaces are done and I also did the same thing but in light pink ribbon for the flower girl. I am still making the ear-rings to match the necklaces. I am using black artistic wire for the ear-ring findings. I have also been asked to come up with the mother-of-the bride's accessories. I think I will go with pearls for that one.